As the climate changes, gardeners are feeling the heat ... and adapting to the new realities. In the United Kingdom, a nation of gardeners, the weather has gone topsy-turvy lately. Deborah Scott Anderson of East Sussex, a gardener of 27 years – and a self-described “obsessive gardener” for the past decade – has observed that weather extremes seem to be growing more common. Sometimes, an entire month will pass without rain, turning grass brown in painstakingly tended traditional English lawns. At other times, the rain comes as a deluge. More rain fell on England last winter than ever previously recorded. “There’s no rhyme or reason to the seasons,” Anderson said. Weather in the future won’t look quite like it has in the past, making it tougher to cultivate backyard flowers and vegetables. Photo source: USDA. Across the Atlantic, Mary Walsh, a master gardener in Rochester, N.Y., has noticed that spring arrives earlier than in the past. And while Rochester still gets plenty of snow, it seems to get dumped in larger, more severe storms rather than accumulating gradually, she said. What both gardeners have observed is consistent with scientific predictions about climate change — that as the Earth’s average temperature rises, heavy precipitation will become more common, droughts will grow more intense, and spring will start earlier in the year. But because of limitations of climate and weather models, it’s hard to know exactly where the intense downpours or droughts will occur, or precisely when spring will begin in a given year. Of one thing gardeners can be sure: Weather in the future won’t look quite like it has in the past. And that makes it tougher to cultivate backyard flowers and vegetables. Figs in New York State, Bananas in East Sussex? To see how the climate for gardeners has changed, look no further than the U.S. Department of Agriculture’s updated plant hardiness zone map, released in 2012. Hardiness zone maps display the average extreme minimum temperatures in a given region. Gardeners use them to figure out which plants typically can survive in their area. The new USDA map is based on average temperatures between 1976 and 2005, an update on a previous version that used data from 1974-1986. On the new map, hardiness zones are shifted generally north, as this interactive map by The Washington Post shows. The milder winters mean gardeners may eventually be able to grow plants they never could in the past, says Lori Brewer, senior extension associate at the Cornell University Garden-Based Learning program. Figs, for example: “People will be excited when they’re able to overwinter figs in New York State,” she says. 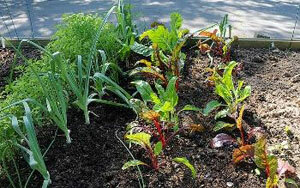 The trouble is, Brewer adds, that insect pests and weeds could also take root more easily in warmer gardens. Anderson, the East Sussex gardener, has kept a banana tree growing in her garden for the past five years. The tree is a special breed that can cope with temperatures as low as -6 degrees Celsius (21 degrees Fahrenheit). She says the tree has yet to produce any actual bananas, but Anderson dotes on it, as she does its three younger siblings. The increasing ease of growing banana trees outdoors in England is the positive side of warmer temperatures, as Anderson sees things. Since 2008, Anderson has been blogging at the website Climate Gardens, where she offers advice and links for gardeners all over the world. The blog helps gardeners adapt to wacky weather, but it’s also a tool for educating the public about climate change. “I felt passionately that gardening is a great way to understand what is happening with the weather or with the climate,” she said. She then explained that such weather extremes and alterations to the seasons are likely to continue as a result of climate change. Brewer, the Cornell extension associate, says gardeners can make their gardens more resilient to weather extremes by returning to good gardening principles, as such collecting and conserving water, trying not to leave soil bare, and creating good drainage conditions. Gardeners, says Walsh, the master gardener in Rochester, can also keep records of new weeds and changes to frost dates and precipitation patterns. That way, they’ll be able to find the new trends. U.S.-based gardeners can also contribute to scientific understanding of climate change through organizations like the National Phenology Network, which gathers data from citizens about flowers, insects, and bird migrations. “That’s a very proactive way for gardeners to be able to contribute to our knowledge about climate change,” Walsh says.